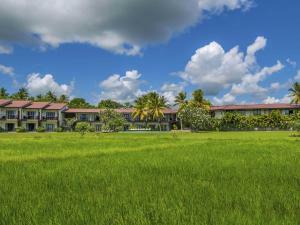 Offering an outdoor swimming pool and a restaurant, Kithala Resort is located in Tissamaharama. Free WiFi access is available in this resort. The accommodation will provide you with air conditioning and a flat-screen satellite TV. There is also a minibar. Featuring a bath or shower, private bathroom comes with a hairdryer and bathrobes. You can enjoy garden view from the balcony. At Kithala Resort you will find a 24-hour front desk, a garden and barbecue facilities. Other facilities offered at the property include luggage storage and laundry facilities. An array of activities can be enjoyed on site or in the surroundings, including cycling. The property offers free parking. If you feel like visiting the surroundings, check out Tissa Wewa (3.7 km). This resort is 21 km from the Mattala Rajapaksa International Airport. You can enjoy refreshing alcoholic and non-alcoholic beverages at the bar. Packed lunches can be requested. Room service is available.